The drive down through the Drimminboy Valley is simply beautiful. 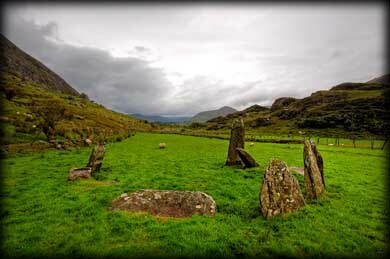 The circle at Shronebirrane stands at the end of the narrow road that cuts through this mountainous terrain. The circle fits perfectly into the rugged landscape. 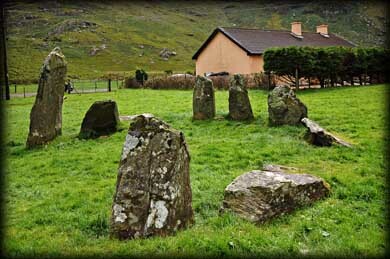 There were originally 13 stones in the circle of which 8 are remaining. The tall north-east portal stone is 2.6 metres high and the stones decrease in height toward the recumbent stone. The 2.8 metre long recumbent is only 0.7 metres high. 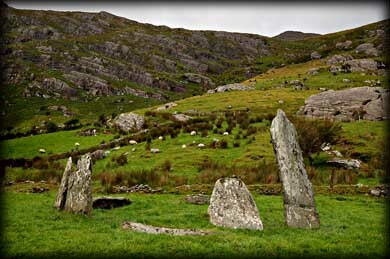 Even though there are probably better and more complete examples of recumbent stone circles on the Beara Peninsula, I was still very impressed with this circle. The only drawback is the close proximity of a modern bungalow. It stands in the same field as the circle. Although you can see the monument from the road the landowners charge a fee of two euros to enter the field. To me personally it was worth it, just to get the view up the valley with the circle in the foreground. If you do visit this circle may I also suggest you stop at the nearby Glanmore lake, one of the most beautiful places I have seen on the Beara Peninsula. 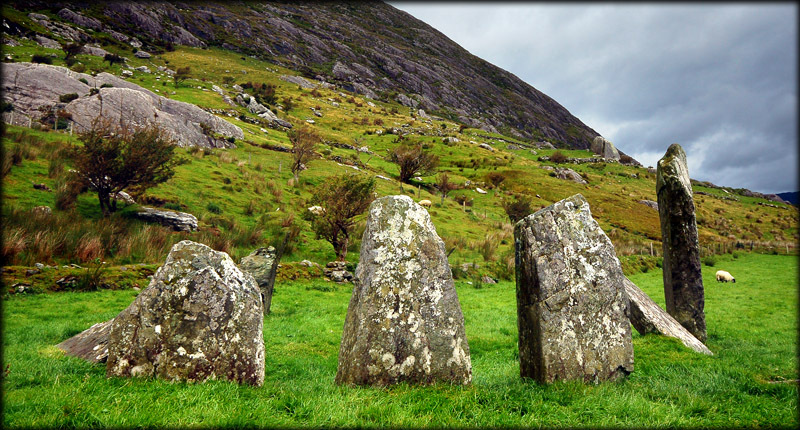 Situated: From Kenmare take the R571 to Reenkilla. Turn left here. After 1 kilometre turn right. The circle is on your right at the end of this road. Discovery Map 84: V 7539 5545. Last visit July 2011.